Data is from the September 2015 Department for Business Innovation & Skills (BIS) report titled "Digital Capabilities in SMEs: Evidence Review and Re-survey of 2014 Small Business Survey respondents" conducted by BMG Research in partnership with the Policy Research Group, Durham University. 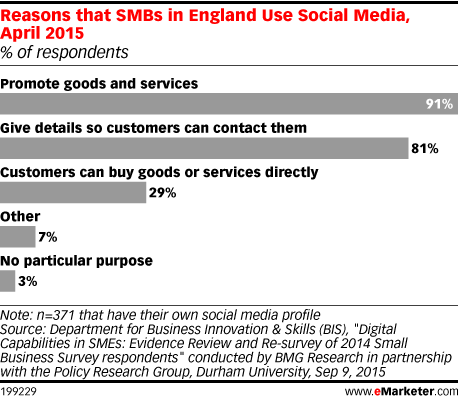 803 small and medium-sized businesses (SMBs) in England were surveyed via telephone during March-April 2015. The sample was drawn from SMBs who had previously taken part in the BIS's 2014 Small Business Survey. SMBs that were most and least active in digital engagement, as established in the previous survey, were mildly oversampled. The Department for Business Innovation & Skills (BIS) is the department for economic growth in the UK.